Even in the easiest of circumstances, moving to a new home challenges the best of us. When the move is to a smaller house, located miles away, the experience can get even more stressful. If you are thinking that your new home is located at Kendal at Oberlin, we want to help you navigate the road to Oberlin, Ohio, with as much ease as possible. Future residents hear of Kendal from a variety of sources. Nearly 40% of current residents have some affiliation with Oberlin College (alumni, former staff or faculty) and often see ads or hear about Kendal in their alumni magazine or during a college reunion or visit to Oberlin. 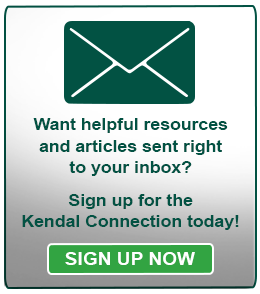 Others find Kendal on the Internet, searching for articles of interest to older adults, including retirement communities, and keep in touch through Kendal’s blogs or weekly email, Kendal Connection. Kendal residents, active and engaged in a variety activities, are not shy about telling others how happy there are to be living in a life plan community based on Quaker values and practices. So, whether “word of mouth” or another avenue has brought you to this juncture, we’re glad you are here. More than 300 blogs on a plethora of topics. Kendal residents maintain a website, too. You can find out what’s for lunch and dinner and what’s going on at Kendal and in Oberlin by watching a daily slide presentation, broadcast on Kendal station Channel 27. The residents’ monthly newsletter, Kendalight, provides more details about events, programs, new residents and updates from the Kendal at Oberlin Residents Association. Kendal has more than 100 resident-run committees and sub-groups, from jazz listening and solo diners to woodshop and horticulture. Share these links with family and friends. They can help you find other articles of interest. The Internet is great, but there’s nothing like up close and personal, which is what a tour will give you. Health and fitness are key at Kendal, which is why it has a four-lane lap pool and therapy pool, an exercise equipment room with state-of-the-art machines (open 24/7), a room with natural light for yoga, tap dance, balance and other classes, outdoor tennis courts and a walking trail. The wellness staff offers almost 70 hours of programming weekly, so residents have lots of opportunities to join a water or land class or activity. 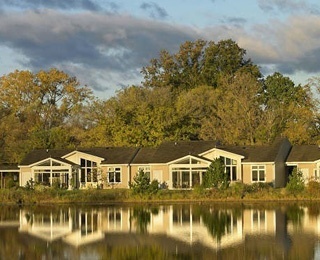 The 100-acre campus is home to eight ponds, more than 1,100 trees and several covered walking bridges, which makes it an attractive place to walk, bike, bird and relax. A couple years ago, the grounds were accredited by ArbNet as The John Bartram Arboretum, which means even more TLC for the natural surroundings. A tour of a model cottage or apartment will help you envision home life at Kendal. Kendal offers three basic options for independent living space: renovated classic cottages, which were built when the community opened in 1993 and are being renovated to include a bright, four-season sun room, larger open kitchen and energy-efficient heating and cooling; newer cottages built between 2006 and 2012, which are larger with a utility room and more walk-in closets; and apartments, which are in the Heiser Community Center and are also undergoing renovation. For your first visit, plan to be at Kendal for 1 ½ to 2 hours. To schedule a tour, contact the Marketing Department, 1-800-548-9469, or click here. You Like Kendal, Now What? After the tour, you’ve put Kendal on your list of possible new homes (maybe at the top), and you want to learn more. For people who live out of town, the Try It, You’ll Like It program is an ideal way to get a feel for what living at Kendal is all about before joining the Priority List. You stay overnight in a model cottage or apartment, take tours, attend events, meet informally with residents and staff, and get to know Oberlin and the surrounding area. Others bypass the overnight and join Kendal’s Priority List. “This is the first step in the admissions process and is recommended for anyone giving serious consideration to entering our community,” explains Terry Kovach, assistant marketing director. Joining the Priority List is easy and obligation-free. A person fills out a 2-page informational application, accompanied by a $1,000 deposit and a $200 processing fee ($300 for a couple). The deposit can be refunded at any time or will be applied to the entry fee upon admission. What is the approximate year you might want to move to Kendal? What type of residence(s) interest you? The priority list gives you benefits, too. Annual financial updates, such as fee updates and disclosure statements. The next step is to apply for the Waiting/Ready List. This process includes completion of 3 forms: personal health history (including authorization to obtain medical records); financial statement and personal information. Once the forms are completed, an on-site admissions interview is scheduled. This is a great opportunity for applicants to ask questions of both staff and residents. This visit includes a thorough review of the contract and more. Once the interview is complete, the Admissions Committee then reviews the application to see if all the requirements are met. Once approved, people are placed on the Waiting/Ready List and are contacted when desired housing becomes available. Now that you can visualize your new home, with a floor plan in hand, it’s time to take stock of your possessions and start downsizing. Moving to Kendal means you will be eating at least one meal a day in the dining room, so you won’t need as many cooking utensils. You’ll want to bring a bike, but not bulky exercise equipment, because Kendal has a fitness center. Ditto for a library, garden and woodworking tools, art supplies, sewing machine and rollaway bed for overnight guests. Artwork that you just can’t part with can be donated to the Art Committee for display somewhere on campus. “I’m amazed how many people move first, downsize later,” says Ted Forthofer, a Certified Relocation & Transition Specialist™ and member of the National Association of Senior Move Managers. Keep in mind Ted’s maxim: Follow the OHIO rule – Only Handle It Once. And don’t worry about getting rid of a lamp or clock that you may need someday. Kendal has a Resale Shop, an affordable, convenient way to buy furnishings and other items for your new home and to donate items you no longer need. In the past, Molly Kavanaugh frequently wrote about Kendal at Oberlin for the Cleveland Plain Dealer, where she was a reporter for 16 years. 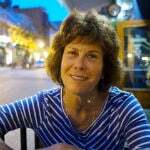 Now we are happy to have her writing for the Kendal at Oberlin Community.